But as they sailed he fell asleep, and a tempest began to rise. In fear they called out for the Master. as their ship safely sailed on. 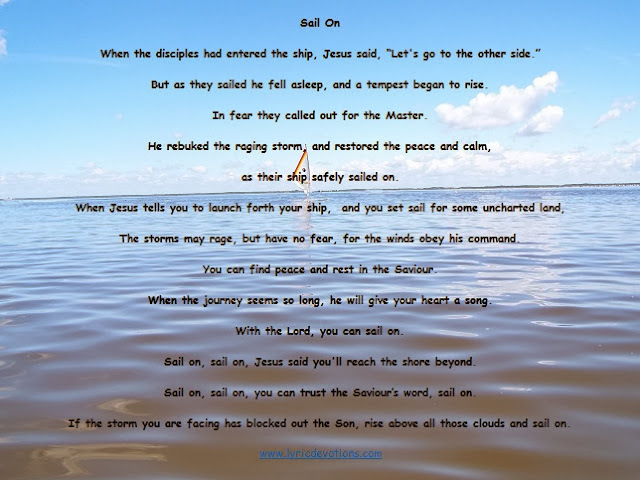 Sail on, sail on, Jesus said you'll reach the shore beyond. Sail on, sail on, you can trust the Saviour’s word, sail on. for the winds obey his command. You can find peace and rest in the Saviour. When the journey seems so long, he will give your heart a song. With the Lord, you can sail on. rise above all those clouds and sail on. If the Lord has called you to something, don't look at the storm clouds brewing overhead or the rough waters in front of you...just step into the boat. Jesus is already there; he already knows what's ahead of you. 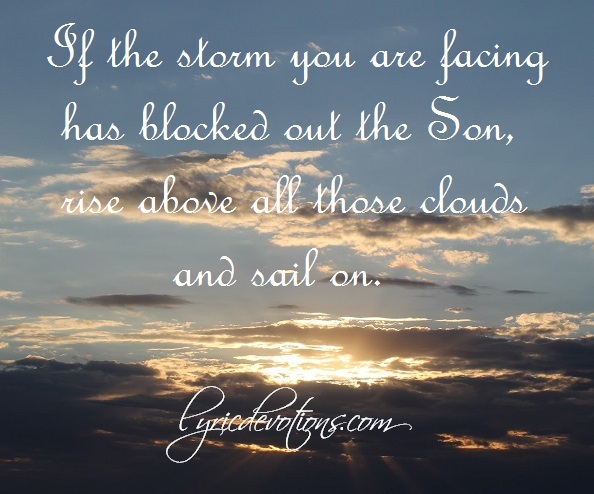 In fact he may have even planned a few storms to bring across your path! If you're already in the boat, and the storms have been raging around you for just a little longer than you think you can handle, and you feel like you're getting nowhere fast, don't jump ship! Jesus is in the boat; he's not in the water. Stay where you are safe! If you're thinking of giving up,and turning back, just trust Jesus, and he will steer you through the rough water. Remember, Jesus said,"Let us go over unto the other side of the lake." He never said how long the trip would take, and he never promised it would be smooth sailing, but if Jesus said you're going to the other side, you can trust his word! Luke 8:22-25 Now it came to pass on a certain day, that he went into a ship with his disciples: and he said unto them, Let us go over unto the other side of the lake. And they launched forth. But as they sailed, he fell asleep: and there came down a storm of wind on the lake; and they were filled with water, and were in jeopardy. And they came to him, and awoke him, saying, Master, Master, we perish. Then he arose and rebuked the wind and the raging of the water: and they ceased, and there was calm. And he said unto them, Where is your faith? And they being afraid wondered, saying one to another, What manner of man is this! for he commandeth even the winds and water, and they obey him. Then he came to the story in Luke 8 where Jesus and his disciples had gotten on a ship, and Jesus said, “Let us go over unto the other side of the lake.” It always amazes me that I can read a story over and over and miss something that a preacher can make seem so obvious! Pastor Unger pointed out that Jesus had told the disciples they were going to the other side of the lake, so when the storm came up, they should have trusted what he had said; they would make it. Sail on! He went on to say that when the water coming in is more real than God’s word, go back to his word, and sail on! He asked if we had ever been to the place where we felt we couldn’t go on? His answer: Jesus said, “We’re going to the other side.” Sail on!